No longer just the domain of just eggheads and slide rules, more high school and college students need to take higher level mathematics courses for their degrees and future employment. Part of the reason is that as fields get more technical knowing the more math is important. Fortunately the days of trigonometry and calculus requiring time-consuming calculations have passed now that most high level courses allow for the usage of a scientific graphing calculator. The question is though, which one is the best one for your needs? In this article we will reveal the best scientific calculators on the market, as well as offer a budget friendly alternative choice. Long held up as the gold standard in graphing and scientific calculators, the Texas Instruments TI-84 has been considered the best calculator for everyone needing trigonometric, graphing, calculus and financial functions. Its ease of use and ubiquity alone would make it the best choice for your needs, but as well, the Zilog Z80 processor packs a lot of power for your needs and the USB port makes creating programs via a computer much easier. While the price hovers around $110 for the basic TI-84 Plus, Texas Instruments offers slightly more expensive models giving the user a colored display and rechargeable battery as well as colored panels to allow for customization. With an automatic shut-off feature, the battery life even on the basic model is quite robust, usually able to get two to three months of usage out of one set of four AAA batteries. In large part because of its merits, the TI-84 Plus is often the recommended calculator for students taking advanced mathematics classes, especially ones requiring graphing. No other calculator combines the reliability, ease of use and durability in one package in the same, strong fashion. 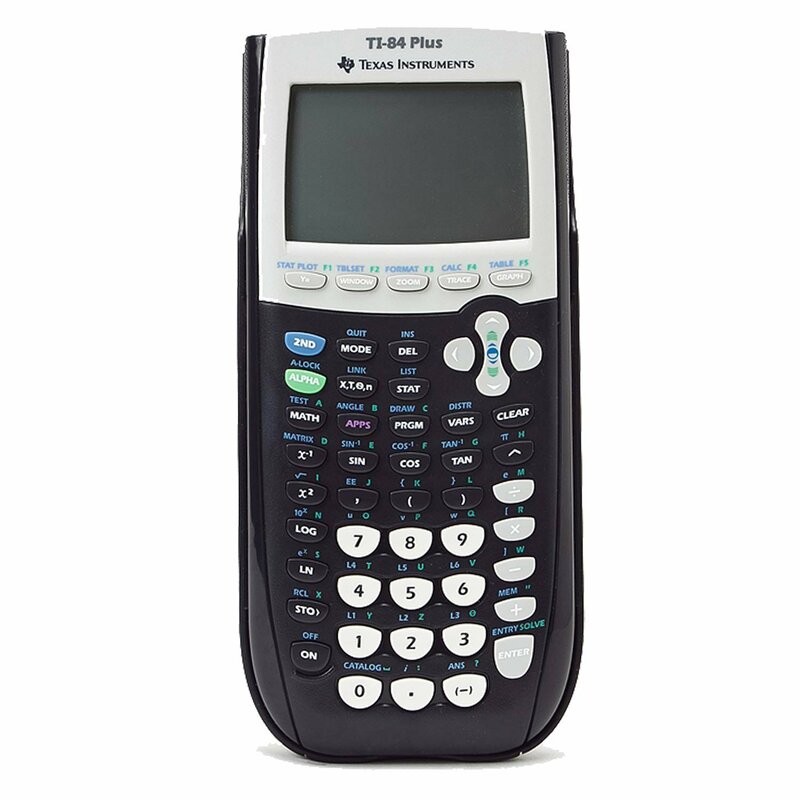 As well as the classroom requirements, the TI-84 Plus is one of the few calculators approved for usage on the SAT and ACT tests as well as the International Baccalaureate. Administrators are able to disable features that would provide too much of advantage to the test taker while still allowing for the ability to understand the process to be tested rather than the ability to perform mathematical computations by pen and paper. Even though it has been the same calculator for over a decade, the TI-84 Plus still packs a lot of power and reliability into its streamlined, yet sturdy case. This calculator can perform even the most complex computations in little to no time and still beats every other scientific and graphing calculator on the market in benchmark testing. Its ability to handle the advanced mathematics thrown at it from every field imagined is only bolstered by the ability to write programs to fit your own needs in either assembly or TI-Basic, Texas Instruments’ own scaled down version of basic. Even if you lack the confidence in your own programming abilities, there likely is a user that has written the exact app you need out there already, available for download. Along with being the classroom standard and its processing power, the TI-84 Plus has several user-friendly features. One of them is the ability to adjust its protective case on the calculator to allow it to sit upright, making work on a desktop much easier. Another is that the USB port allows for a keyboard to be attached to the calculator to enable note taking or easier input of programming information. Finally, there are several app pre-loaded onto the calculator like Probability Simulator and Cabri Jr., a solid geometric app, to go with a vast library of apps available through Texas Instruments or other TI-84 Plus users. Considering its popularity in most academic and scientific fields, the learning curve for what appears to be a complex piece of equipment is eased by having any number of people, whether teachers, coworkers or students using the calculator and able to share knowledge. If there is a drawback to the TI-84 Plus, it can appear to be very expensive compared to other calculators. But this one calculator can be used by a student from Algebra through and beyond Calculus even in the workforce and it is built well enough to last for years. The solid plastic outer case is made to absorb the shock of a drop from a desk and keep on calculating. So if you have a student who is expecting to take a lot of advanced mathematics, the investment is well worth it. While not as laden with features as the TI-84 Plus, the HP 35s Scientific Calculator is still a great calculator, especially if graphing and ability to generate customized programs are not integral to your needs. The most impressive feature of the HP 35s is its versatility, it is the only scientific calculator on the market that allows the user to input in either algebraic or Reverse Polish Notation. The HP35s might look like a relic, with its design recalling the original Hewlett-Packard scientific calculators released in the 70s and 80s, but it packs a good deal of memory and power inside its retro look. Geared more toward industrial and engineering use rather than the needs of the average student, the HP 35s has several features which make it ideal for usage in the field. The dust-proof, two-line LCD display gives not only a lot of room to display results, but has adjustable contrast to allow the user to read the display in the varying angles and levels of light that can be found in the field. Unlike many scientific calculators, the HP 35s is capable of displaying fractions, which can be convenient when working with imperial measurements. Also, this calculator, much like the more powerful graphing calculators, has ample memory from programs, as well as no arbitrary character limit on equations. As well, the HP 35s has the HP-Solve feature, enabling equation solving and variable isolation. This calculator also features imperial to metric conversions and over 100 built-in constants available with a simple keystroke or two. What sets the HP 35s apart from the field though is the size of its memory and its ability to manage that memory. By allowing both Algebraic and Reverse Polish Notation inputting, it enables the user to save memory and stack space for computations and programs. This also enables the HP35 to work with more complex or imaginary numbers, as well handle vector computations. Its robust memory also allows for data storage, enabling the user to recall equations as needed. The programming is keystroke based and while it takes a little getting used to for the entry-level user, can prove more than capable of serving the needs of the average HP 35s user. Like was said with the TI-84 Plus, most students will likely need or want a graphing calculator because of the need for those functions in the classroom. The HP 35s is the best choice for professional, practical usage. In the field, the HP 35s will prove itself more than sufficient for its users’ needs. As well, it is the most advanced calculator allowed on many professional certification tests, including the Fundamentals of Engineering and Principle and Practice of Engineering tests. Much like the TI-84 Plus, the cost of this calculator is on the higher end of its market, but its power and memory capabilities more than make this calculator worth every penny spent. Geared more towards the needs of younger or less-advanced math students, the TI-30X IIS is still the best choice if you do not expect to need graphing, a large amount of memory or programming from your calculator. 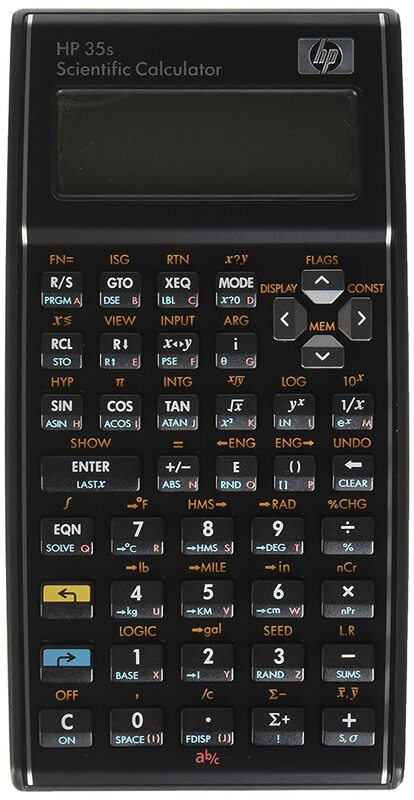 Even though its list of features might pale in comparison to the TI-84 Plus or the HP 35s, if you just plan on performing nothing more than basic trigonometric, scientific or statistical functions, the TI-30X IIS will meet your needs while still giving more than a few features above the typical basic scientific calculators. 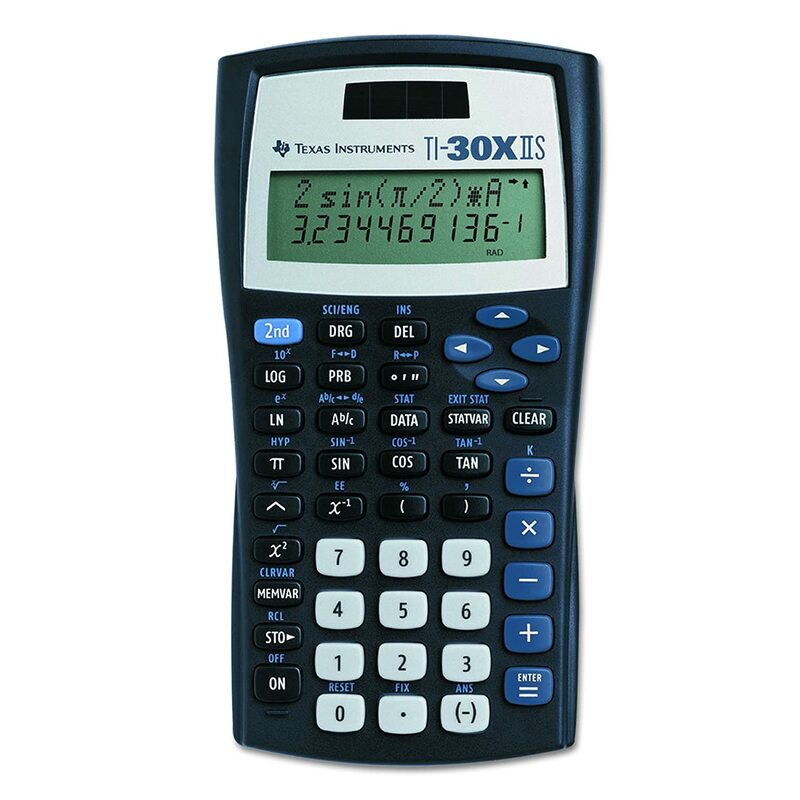 Like the HP 35s, the TI-30X IIS has a two line display along with scrolling and backspace capabilities, which allows the user to see the equation being inputted, manipulate it if needed and see the result simultaneously. This enables the user to see their potential errors as well as process a large amount of data more efficiently than having to enter the same equation, just to change the data points. It also has the ability to work with fractions, although not as easily as the much more powerful HP 35s. Typical to Texas Instruments calculators, durability is a key feature. The calculator itself is fairly sturdy, which is only improved by the slide-off protective case for when it is not in use. Built to be used and abused by the typical teenager, the TI-30X IIS can take a beating but will still function for years. Users report this calculator able to handle having coffee spilled on it, drops onto hard floors, inadvertent step on them and much more and still work reliably. Also, it couples its solar battery with an internal battery in case the user is working in a low light situation which most users report lasted several years. While not as powerful or feature filled as the TI-84 Plus or the HP 35s, for many users, even engineering students and professionals, the TI-30X IIS could likely be all the calculator you truly need. With its pricing at a much more reasonably around $20, this calculator can get a student at least through junior high school and early high school math classes or be a great calculator for those who only occasionally need basic scientific functions. At its core though, the TI-30X IIS is closer to just being a simple calculator. There are not the bells and whistles of the more expensive calculators. This means that while you might not have the ability to draw graphs or create programs, obviously this calculator would be simple and straightforward to use. Most importantly though, compared to similar calculators, the TI-30X IIS is a superior product and recommended if a user does not need all the bells and whistles, but still needs a calculator that can do a little more advanced mathematical work. Somewhat in between the HP 35s and the TI-30X IIS in both functionality and price, the Casio FX-991 ESPLUS brings a lot to the user at a reasonable price. With its straightforward functionality and a key and display layout oriented more for the math student than the engineer, this calculator gives a little more than the TI-30X in terms of functionality, including an equation solver which while limited in comparison to what is available on most Hewlett-Packard calculators, still delivers more than many calculators in its price range. The FX-991 even handles defined calculus functions which was all but unheard of at this price range. While the FX-991 ESPLUS lacks the memory of the HP 35s, it offers many, although not all, of the same conversions and constants that the HP 35s makes available. Where it really comes up short compared to the HP 35s though is its lack of an RPN style input. Even then, the FX-991 ESPLUS is more of a scientific calculator for the math student, so its focus on a more textbook friendly input style makes for such tradeoffs. A clear drawback though is that it is not as durable as the offerings from Texas Instruments’ offerings. There is no protective case available and there were some complaints about the screen scratching if just thrown into a backpack or a locker. Even with these concerns, the capabilities of the Casio FX-991 ESPLUS make it a bargain at its current price. Why do I need this scientific calculator? The primary consideration for the user should be for what do you need the calculator. Where a student in a calculus or pre-calculus class may need graphing function and the ability to handle integrals, a professional may just need to handle complex computations and storing equations. Keep in mind for students or for testing that sometimes certain calculators may be recommended, expected or disallowed depending on exactly what is being covered or tested. It is likely best to talk to teachers, professors or professionals in the field depending on why you are buying your calculator. Simply put, the student’s concern should be the highest level of math they expect to take and the professional should factor in the depth of mathematical computation they need to perform. It is rare that a professional in the field would need graphing, but there are cases where that may be necessary. With the price difference being upwards of $50, knowing if you will need a graphic calculator or what level of scientific calculator you need can make a difference in your satisfaction with your purchase. Another need to consider is, especially with the more expensive graphic calculators, for how long do you expect to need a given calculator. If a student is on a track to take calculus, it may be worth it just to buy a graphic calculator a year or two early since they will need that calculator for several years. At the same time, if your student is likely stopping with algebra or geometry for their math classes, a more simple scientific calculator would likely serve them well for years. How much should I spend on a scientific calculator? An obvious factor in purchasing anything is going to be the price and calculators are no different. You should know how the market for the calculator with the features you need is priced and consider your purchase accordingly. This will also help you find a bargain and could allow you to discover a good value on a used calculator if you are looking at saving a little more money. Even then, it’s rare for many higher-end graphing and scientific calculators to go on sale in part because the volume sold of graphing calculators is enough to keep their price down and stable and the scientific calculators tend to have a limited market. 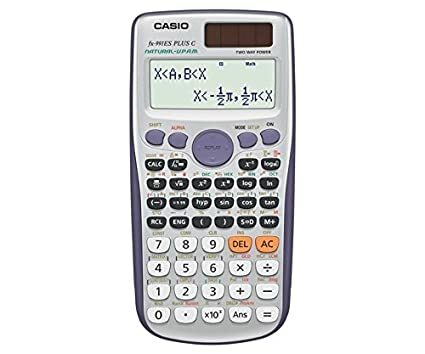 As well, keep in mind the value of the features you are buying, the example of the Casio FX-991 is a great buy since it stacks up very well in comparison to other calculators at its price point. Many times as well, a cheaper, unfamiliar brand may skimp on things like durability, functionality or reliability just to save a few bucks. Another thing to consider is the durability of the calculator you are purchasing. Texas Instruments in general have a great reputation for taking a beating. If you are familiar with buying things for teenagers, you know that breakage can be common unless the device is built to last. Again you might save a couple of dollars by going with a calculator which doesn’t have the padding or the protective case, but it is likely that you will have to buy another calculator when that one breaks from rough usage. It is important to make sure when buying your scientific calculator that it does what you want. Saving a few dollars is meaningless if you find out that the calculator that you bought does not handle something that you need it when you are in class or in the field at work. Carefully go over features like memory size, display quality and available functions since it is impossible without buying a new calculator to address these issues if you find yourself wanting them after you purchase them. Other functions to think about is if it handles metric conversions, statistics, calculus and if it contains constants. These features range from important to convenient and knowing which are important to you and if a given scientific calculator can deliver it makes a difference in your purchase. Also knowing input style and display capabilities will be important, especially if you know you need a certain format or number of significant digits. Does this calculator do what I need easily? Finally, you should look at the functionality of your scientific calculator. Every scientific and graphing calculator conserves keys and space on their calculator by putting multiple functions on each key and employing a shift or alt key to access those functions. Tying into functionality and need, you need to factor in if executing a certain task or constant is simple or requires several potentially frustrating keystrokes. Many calculators designed for use by a specific group, laying out keys in a way that is most convenient for them. Students in algebra class will need different functions than ones in physics. And engineers and technicians need to perform different calculations. The scientific calculator is a tool to help you do computations quickly, having to hunt or perform complex keystrokes for a common function defeats that purpose and will likely reduce your satisfaction with your purchase. There are many scientific calculators out there. The right or wrong one can make the difference at school or work. between working with speed and accuracy or struggling with frustration and corrections. If you consider your needs, budget, function and ease of use, you can make your purchase that simpler and more satisfying. As well, keep in mind our recommendations for each level of your potential needs and budget. Keep in mind that the best product in our opinion, while a great calculator, may be much more calculator that what you need or want in a calculator. It is important to consider what feels right for you as much as our advice when making this purchase, as many factors in your purchase are going to be based on circumstances more or less unique to you.